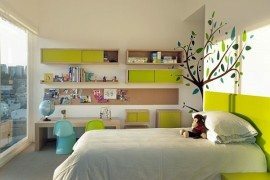 We all know that sharing means caring, but it can be hard to get your kids to feel the same way about co-habitating a bedroom. 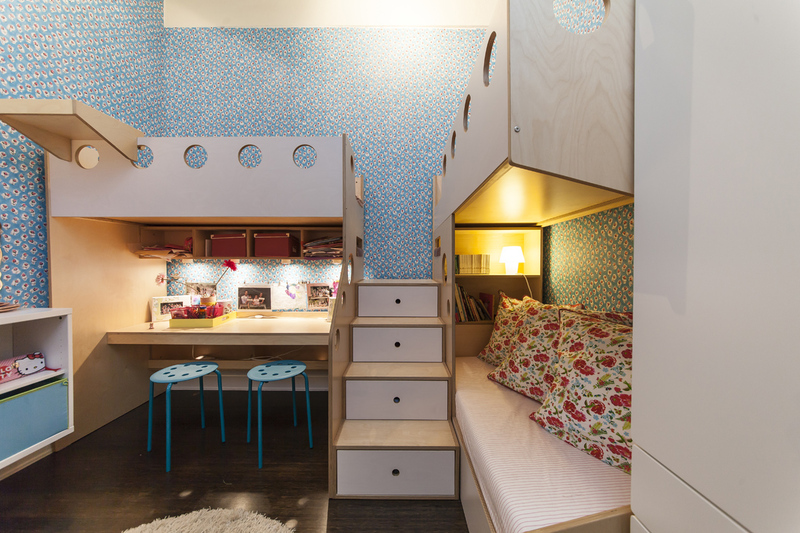 We recently stumbled upon a collection of modular, customizable children’s bedroom furniture by NYC-based Casa Kids that is so cool it will make your little ones forget their disdain for roommates. 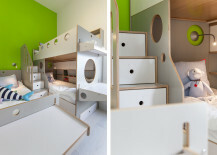 Read on for eight Casa Kids cases studies and see how they used their loft beds, bunk beds and Murphy beds in all kinds of configurations to create bedrooms for their smallest clients. Step Up the Shared Style! 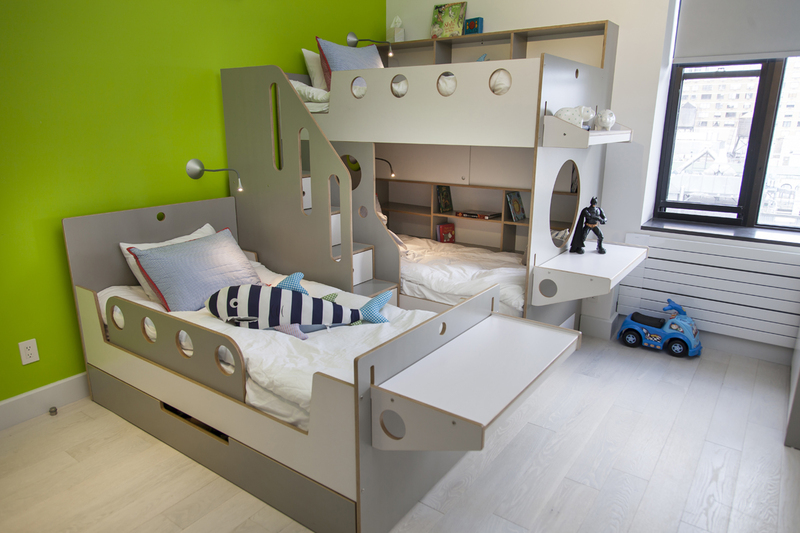 Grace and Rose’s symmetrical bedroom has a ship-like look that makes it almost feel like sleeping in the cabin of a boat. 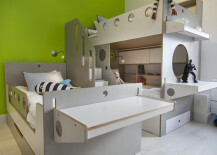 The circular “portholes” on both beds encourage play, while the staircases double as dressers. 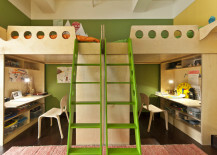 Namkha and Riga’s green bedroom with twin loft beds makes the most of a very narrow space with twin green staircases leading up to their side-by-side bunks. 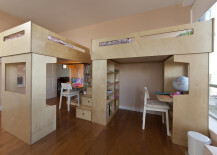 The sideguards allow for safety and privacy while adding a playful design element. 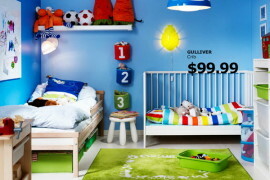 Creating physical space for each sibling is just half the battle – it’s also important for each child to feel that he or she is being treated equally. 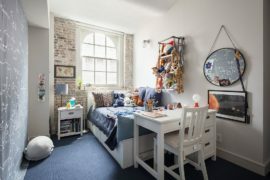 This symmetrical sisters’ bedroom with a shared central staircase ticks both boxes with its equitable, mirror-image design. 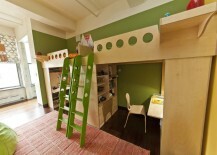 For this particularly tiny shared bedroom, Casa Kids created their loft beds in modified, slightly smaller junior sizes. 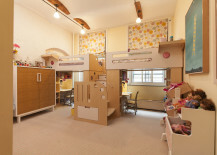 Luckily, the two sisters inhabiting the space work and play well together, so an extra-long desk allows them to do homework side-by-side. 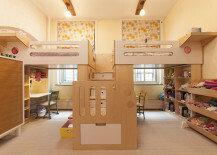 Sisters Isabel and Delia share a light-filled bedroom with a large window, so Casa Kids was concerned about having to block it with the Dumbo loft bed system they designed for the girls. The solution? 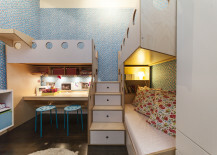 Strategically placed square cutouts in the sides of the pieces provide views for each girl as they sit at their desks doing homework. 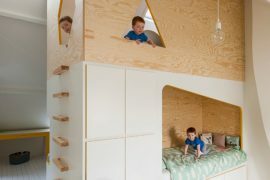 You can imagine how difficult it is to fit three boys into one small urban bedroom, but this space for a trio of brothers does the trick with its smart layout. 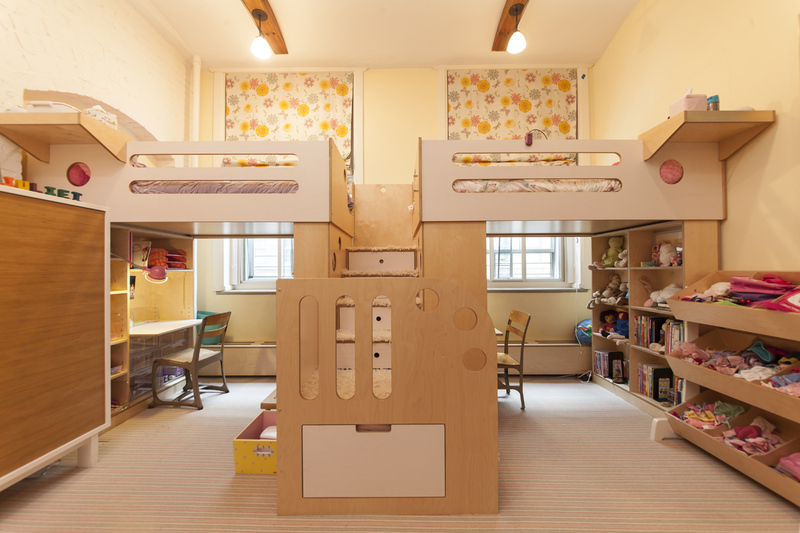 Both the loft bed and the single bed feature add-on desks, giving everyone a place to sleep and providing spots for the older boys to study. 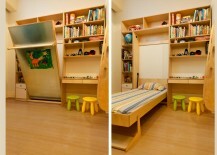 Rohan and Milan’s room has enough space to sleep two, as well as a Casa Kids fold-out Tuck bed for visiting grandparents. 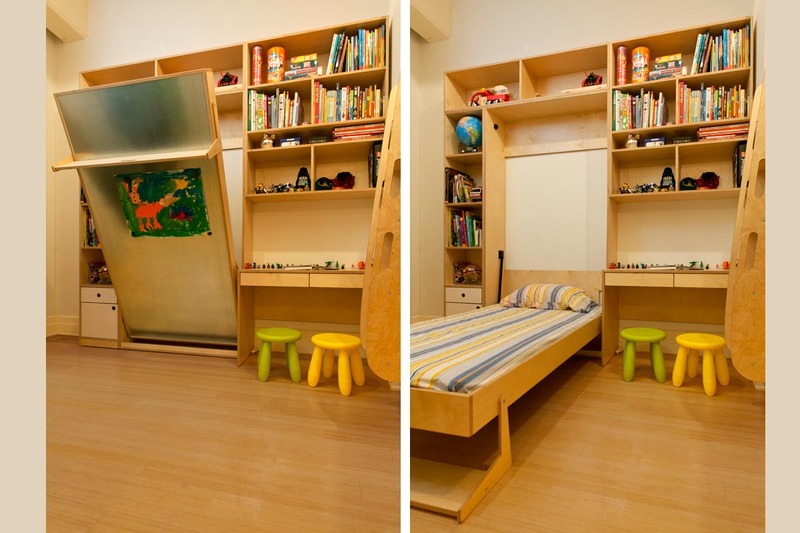 When the bed is not in use, its underside doubles as a handy magnet board to display art. 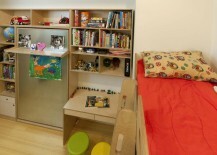 Casa Kids took a slightly different approach in order to maximize the space in Sophia and Sean’s shared bedroom. 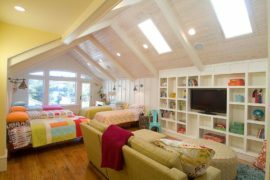 Instead of building on one side of the room, they chose to create two separate lines of furniture along the perimeter of the room. 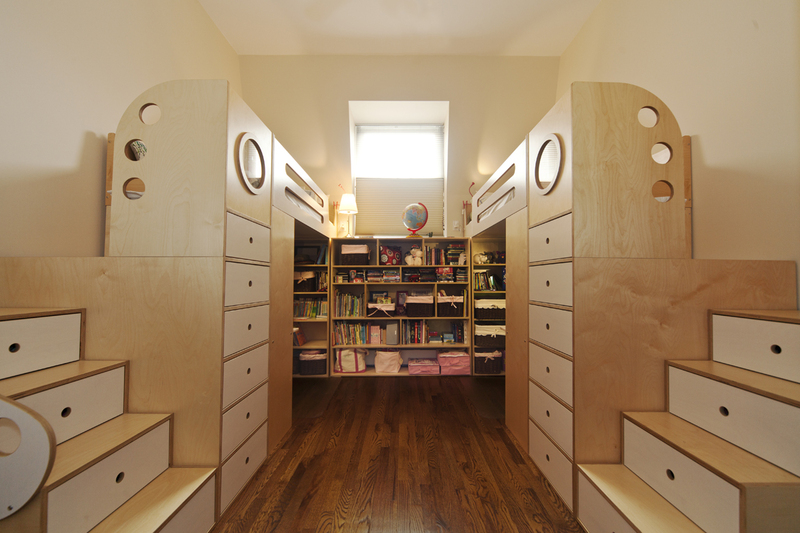 This resulted in a wall of desks and another wall with a bunk bed and storage system built to be the same level as the upper bunk in order to create the illusion that the two units were actually one large continuous piece. 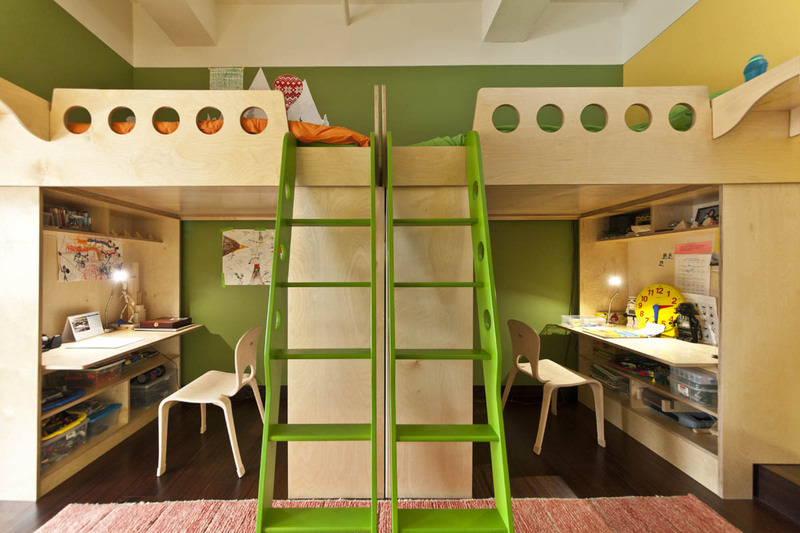 Which one of these thoughtful bedrooms would your kids want as their own?